Behind the Chamber 2017: Gala Handel | ¡VidaMaz! Every winter in Mazatlán we are privileged to enjoy a series of innovative chamber concerts on Sundays at noon. The Campbell Chamber, or Camerata Campbell, was formed in 2012, and its repertoire is based on classical and baroque music. It is an independent project supported by CULTURA Mazatlán, Instituto Sinaloense de Cultura, Proyecto Centro Histórico Mazatlán, our two local hotel associations, as well as the local and foreign communities. This year’s season will take place January 15 through March 5, 2017. Usually the concerts are held in the Angela Peralta Theater, but twice this season Carnavál events will dictate that the concerts take place in Casa Haas. You can purchase your tickets for specific concerts (300 pesos each) or a series pass (2000 pesos) at the Angela Peralta Theater box office—open 9am-3pm and 5-7pm—or online at CULTURA Mazatlán. In 2015 we published a series of “Behind the Chamber” interviews with Gordon and his wife and collaborator, Guianeya Román. So many of you told us how delightful and helpful those sneak peeks were that we have reprised the interviews again this season. 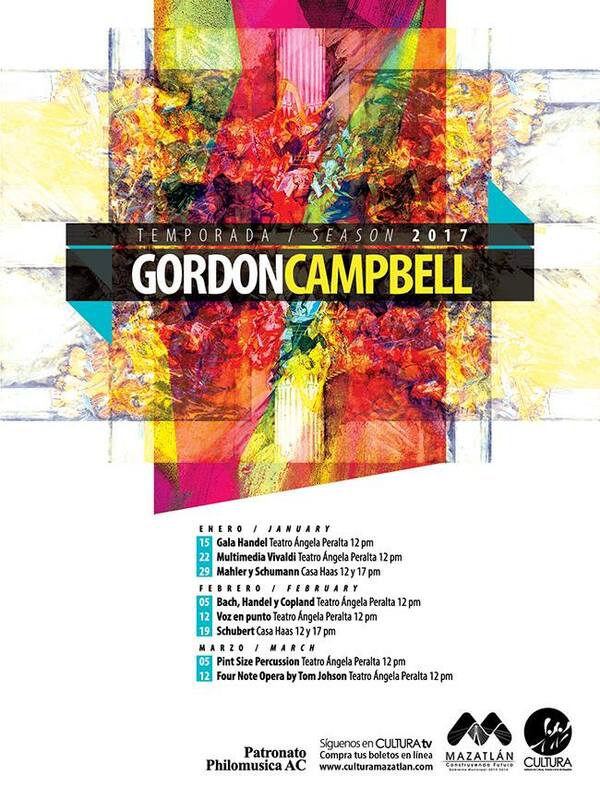 Director of our state symphony, the Orquesta Sinfónica Sinaloa de las Artes, Maestro Gordon Campbell was born in Youngstown, Ohio. Most of his life he has played the coronet professionally, and he directed orchestras in Paraguay, Uruguay and the USA in addition to Mexico. His multicultural experience has lead Gordon to produce innovative programming with a fusion of influences, blending classical and baroque music with Big Band, mariachi, tango, danzón, and the sounds of Paquito d’Rivera, Arturo Sandoval, the Beatles, Queen, Ferrusquilla and Pedro Infante. Gordon received Mexico’s most prestigious classical music award—the Mozart Media—in 2007, awarded to him at the Palacio Nacional de Bellas Artes in 2007 by the Austrian Ambassador. Twice his orchestras have been invited to perform at the internationally respected Festival Internacional Cervantino in Guanajuato: once with the Aguascalientes state orchestra in 1997, and again with the Sinaloa state orchestra in 2012. Pingback: Behind the Chamber 2017: Multimedia Vivaldi | ¡VidaMaz!